MASH 66 start time on Saturday (May 31st) is 1700! MASH 67 start time on Sunday (June 1st) is 1400!! By Public Transportation: Take Line 6 to Mapo-Gu Office Station (#620)(600 won). Leave Subway by Exit 2. Plan to take a taxi, walk to the Nanji Campgrounds, or coordinate with someone for a ride. 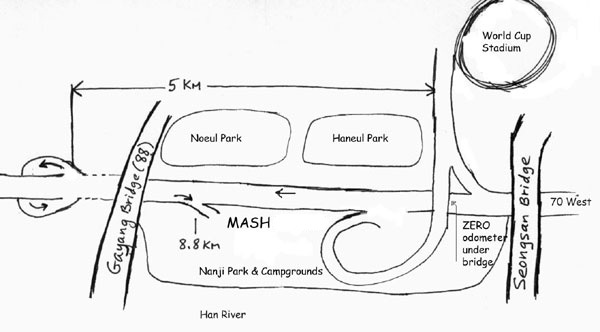 (See Map) Once you get to the riverside park, walk towards the west to the Nanji Campgrounds to MASH 66 & 67 onsite! By Car: Locate The World Cup Stadium in western Seoul north of the Han River on a map. The easiest way is to drive west on 70. After you pass under the Seongsan Bridge, prepare to zero your odometer at the next overpass (approx 300 m). Zero your odometer as you pass under the Nanji Park access bridge. Continue past both of the garbage mountains, past the Gayang Bridge, past the Tank traps, and prepare to exit to your right. At 5 km, exit 70 to pass under the highway and drive back towards the east. Note: the exit sign is partially covered by a bush so be ready! Once you have passed under 70 and are driving east next to Nanji Park, prepare to exit to your right after you pass under the Gayang Bridge again. At 8.8 km, exit 70 into Nanji Park. Continue east until you get to the Nanji Campgrounds and the MASH 66 & 67 onsite! Call 011-9703-0026 if you get lost! If you're planning to camp with MASH, we will try to congregate on the west end of the campgrounds. You can arrive anytime between 1300 and 2000 (1pm and 8pm). I have made reservations for "MASH" so tell them who you are with. If you are camping, remember that you will need to bring your own bedding, food, and probably cooking utensils. We can rent tents, sleeping pads, grills, lanterns, and probably other creature comfort assessories. Plan to bring 30,000 won per tent to cover all of your rental costs. The earlier you arrive, the more choice you have of the available tent sites. We will run an A to B easy "fun run" MASH hash at 1700 with a BBQ afterwards. After that, we can sing, enjoy each others company, do some star gazing, whatever. The payment for Saturday's MASH 66 will cover you for Sunday's MASH 67 as well. If you are not planning to camp but still want to join for the main MASH hash on Sunday, that is fine also! MASH 67/HATROK on Sunday will start at 1400 so try to be there by 1330! There will be the usual snacks and drinks after both MASH 66 & 67 but be advised that MASH will not be providing beer for the entire evening! Bring your own evening libation. I will be enjoying some wine! !